It doesn't get much worse than this folks. To Catch A Yeti is bad in every respect, beginning with the creature itself. The bug-eyed gooning animatronic representing said beast is an insult to cinema, with movement literally restricted to the thing being dragged along, on a poorly disguised sled, through the snow. Similarly the annoying coos which emanate from the Yeti's static plastic face are an annoying as they are bizarre. Beyond that the production values are below par from children's television, never mind a movie, and its star, one Meat Loaf, though tasked with the difficult job astonishingly manages to be the worst feature in the entire film, proving once and for all that rock music saved many a movie audience from his bewilderingly insensate acting style. 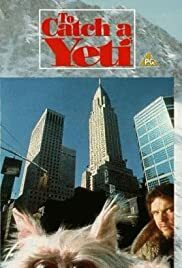 Plot and characters, in as much as they exists, are instantly forgettable, and quite honestly you'll spend the entire film being obsessively irritated by the Yeti. Yes, it really is that lamentable. Arguably children might get something out of this on a Saturday morning while mom and dad enjoy a lie in, but an enjoyable family film this isn't.